I've started up with a new CSA (Community Supported Agriculture) box from Tomatero Farm last week and there have been huge bunches of cilantro in them (along with other amazing winter greens, lettuces, and other vegetables.) My friend Marcus shared how he had gotten through his bunch of cilantro in one fell swoop by making a pesto with it. I tried a taste of his version the other day and it was inspiring so I did a little research and came up with this version. This entire meal took about an hour total from start to finish. 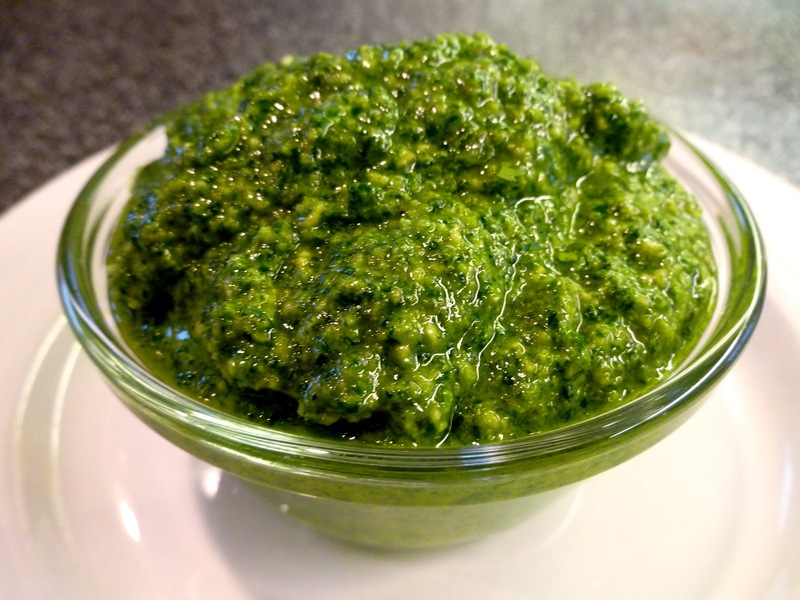 In a food processor, pulse the cilantro, garlic, and pumpkin seeds and cayenne until coarse. Then, turn the food processor to continuously on and slowly add the olive oil in a steady stream along with the lime until you get a consistency somewhere between a paste and a sauce. You don't want it too gummy, but you also don't want it too runny. Add a pinch of salt, pulse the processor and taste. Add more salt to your taste. Put on ANY protein--seriously, just had it with eggs this morning and it was outstanding. It will keep about a day or 2 tightly wrapped in the refrigerator. Skirt Steak is so quick and easy to prepare. Rub oil on steak, sprinkle with salt and pepper, let marinate for at least 15min. while grill is getting hot. Grill 3 min. per side for medium rare/medium. Heat a couple of "glugs" of olive oil in a large saute pan. Cook the onion on medium for 5 minutes until soft. Add the garlic and cook until fragrant, about 1-2 min.--make sure you actually stir the onions and garlic around, nothing worse than burnt garlic. Add the chopped greens (really you can do this method with any winter green--kale, chard, beet greens, spinach) and saute for another 10-15 min. until tender. Add a squeeze of lemon and salt to taste and stir up for 1 more min. I wanted a roast tonight but didn't want to spend too much time worrying about it. This recipe from The Complete Meat Cookbook, by Bruce Aidells and Denis Kelly fit the bill perfectly. Remember when Strawberry Spinach Salad was all the rage? I put a little modern spin on the dressing that I think you would all enjoy giving a shot at. Brush roast with balsamic vinegar. Make a paste with remaining ingredients and apply to meat. 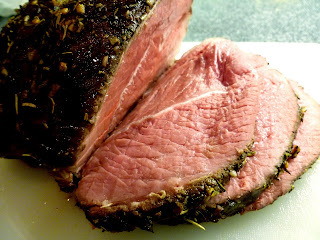 Roast meat at 450 for 15 minutes Reduce heat to 350 and cook for 40 to 60 minutes, or until internal temperature reaches 125. Remove from oven; cover loosely with foil and let stand 15 to 25 minutes. 2 1/2 tablespoons infused vinegar, I used a tangerine balsamic. I bet raspberry or lemon would be great too. 3 tablespoons olive oil; alternately you can use an infused olive oil here. Whisk together vinegar, a rounded 1/4 teaspoon salt, and 1/8 teaspoon pepper in a small bowl, then add oil in a slow stream, whisking well. 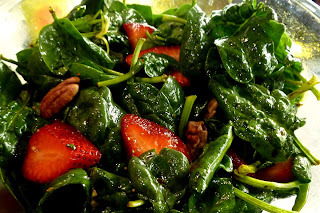 Put spinach, strawberries, and pecans in a large bowl and toss with just enough vinaigrette to lightly coat. I expect everyone who eats meat has a lemon chicken recipe in their lives. When a co-worker, relative, neighbor or gym friend (Kate!) brings them to the office, leaves them out on the curb, or just brings them over, use them! Buying them at the store or even the farmer's market is a waste of money. I found a great recipe on Simply Recipes and modified it a bit. 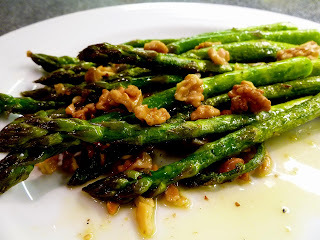 I served it with some Asparagus with Walnuts and a simple green salad and it was delicious. Leo asked for 2 servings of the chicken so that was a good sign and the first time I made it, Steve polished off close to a pound of the stuff. This time I made close to 3 pounds so I could have it the next day in a salad--it also helps that Steve was out of town so planned leftovers were an actuality. Place olive oil, lemon juice, lemon peel, garlic, thyme, rosemary, salt, and pepper in a small bowl, whisk to combine. With the tip of a sharp knife, cut into each chicken piece one or two times by about 1/2 an inch. (This will help the marinade penetrate.) Place the chicken pieces and the marinade in a gallon-sized freezer bag. Rotate the bag so that all chicken pieces are coated with the marinade. Seal the bag and place in a bowl in the refrigerator (in case of leakage). Let marinate for 2 hours. Preheat oven to 425°F. 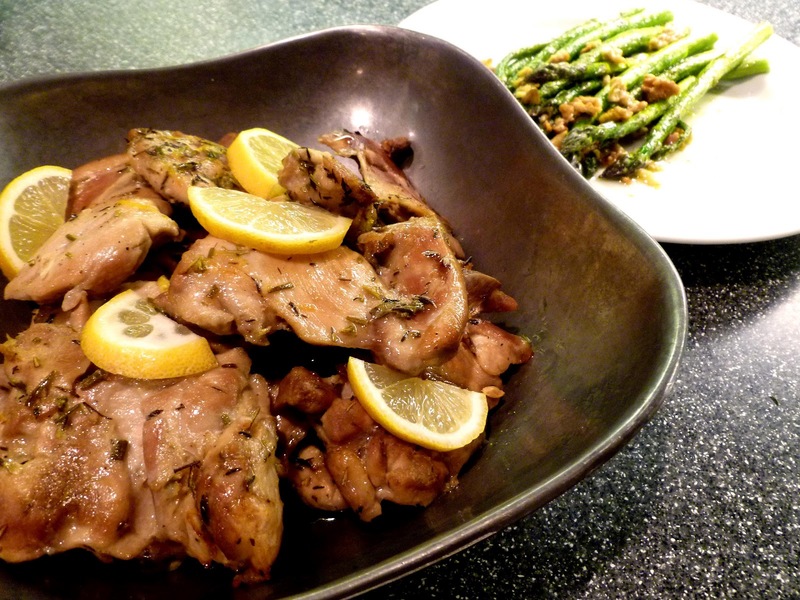 Remove chicken from marinade and place in a single layer in a large baking dish, skin side up. Reserve the marinade. Use a pastry brush to brush a little melted butter on to each piece of chicken. Bake for a total of 50 to 55 minutes (40 min. if just using boneless skinless thighs), until the skins are crispy brown, and the chicken is cooked through, juices running clear (breasts have an internal temperature of 165°F and thighs 175°F). Half-way through the baking, at about the 25 minute mark, baste the chicken pieces generously with reserved marinade. Pour the juices from the pan into a serving bowl. Use a tablespoon to skim the fat off the top (save the fat for cooking with later, or discard, but do not discard down the drain or it will solidify and clog your drain). Serve the chicken with the juices on the side or add the toasted walnuts then pour the marinade over the top of the chicken. Heat the oil or butter in a large saute pan until hot but not smoking. Add the asparagus and saute, adding the salt and pepper and stirring occasionally for about 15 min. Let the tips get brown, even charred a bit. The last 2 minutes add the walnuts and let them heat up with the asparagus. This was a very clean, light yet filling dinner salad. The flavors are strong, but curiously addictive. Fish Sauce or Nam Pla, is insanely good for you. A staple condiment throughout Asia (much like ketchup is to us here in America), it is rich in iodine and other substances that benefit the thyroid gland. When heated it loses its fishy flavor, but served cold as it is in this recipe, the fish flavor is mostly muted by the strong herbs, chilis, and lime juice. I used a beautiful savoy cabbage from Tomatero Farms and the rib eye steak was from Panorama Meats purchased from Whole Foods. Although lemongrass, cilantro, and the serrano chili were easy to find (again at Whole Foods, but any independent grocer should carry these items), mint was elusive and will probably continue to be until we get more consistently warm weather. I used dried mint instead, about 2 TBSP., and it came out great. 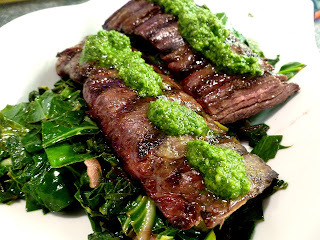 Be sure to check out the reviews section of this recipe from Epicurious. Lots of creative ways to mix up the herbs in this one. 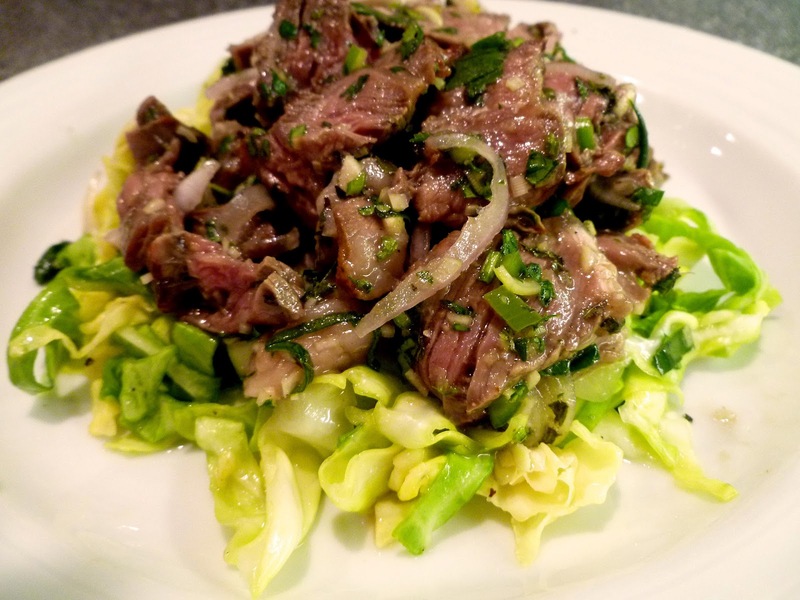 Combine sliced cabbage, 2 tablespoons lime juice, and 1 tablespoon fish sauce in large bowl; toss to blend. Season with salt and pepper; set cabbage mixture aside for up to 30 minutes. Prepare barbecue (medium-high heat). Sprinkle steaks with salt and pepper. Grill until cooked to desired doneness, 3 minutes per side for medium-rare. Transfer steaks to work surface; cut crosswise into thin slices. Place sliced steaks in large bowl. Add shallots, onion tops, cilantro, mint, lemongrass, and chili, then remaining 3 tablespoons lime juice and 2 tablespoons fish sauce. Toss to blend. Season salad with salt and pepper. Divide cabbage mixture among 4 plates. Top each with beef salad.